While I count myself a happy Bolt owner, I’ve also learned that being an early EV adopter comes with a lot of challenges, mostly in terms of the availability and functionality of charging infrastructure. Driving an EV—especially as your only vehicle—definitely requires you to be more strategic and thoughtful than driving a conventional car. As someone who studies EVs as part of my job, this shouldn’t have been news to me, but my newfound firsthand experience has driven home the positives and negatives of being an EV owner. To mark my 5,000-mile milestone, I thought I’d share some of those lessons. Happiness is actually getting a parking spot at the airport with a charger. This [photo shows] the first time Austin won the charger “lottery” at Sacramento Airport! Photo courtesy Austin Brown. A few months and 10 times as many miles later [after my 500 mile article], I still love my Chevy Bolt. My average efficiency has dropped a bit from my first post, perhaps because the tires were a little lower pressure for a while, or maybe I just stopped being so obsessive about it. It’s still averaging about 3.9 miles / kWh with the vast majority of miles on highway. I can safely and comfortably walk and bike around Davis so I rarely drive in town, but have surprised myself by driving more than 40 miles a day on average. I definitely got to 5,000 miles more quickly than I anticipated! My most common weekday use is getting to Sacramento for work purposes, and I routinely drive to the Bay Area (though I still prefer the train if the timing works out since I can work or read). I also have had a great time using the car for weekend trips (details below).I’m still very impressed with the performance, range, and general fun of the Bolt. I’ve found that people are very curious about the car, and now that I have an HOV sticker more people notice that my car is an electric vehicle (EV) and ask me about it. The number-one question I get is, “How do you know it won’t run out of charge?” My go-to answer: “How do you know your car won’t run out of gas?” The Bolt, like any car, tells you right on the dashboard how far you can go before you run into trouble. By Austin Brown, Executive Director of the UC Davis Policy Institute for Energy, Environment, and the Economy. This is a follow up to a previous post, “500 miles of Bolt ownership” (November 28, 2017). The original post can be found on the Policy Institute web site. Read on for more. Interested in a test drive? Check out the EVs@theMarket Ride&Drive and Show&Tell coming up Saturday September 15, 2018, at Davis Farmer’s Market. EV charging options vary more than fuel options for conventional vehicles. At a gas station, you often only have two choices: regular or premium, and though the latter might be more expensive, both usually work. (Side note: always go for regular unless your car manufacturer specifically tells you otherwise. But that’s a topic for another day.) With EVs, though, the three commonly available charging options—level 1, level 2, and DC fast charge—vary considerably in terms of charging speed and cost. The California Clean Vehicle Rebate project provides more information on EV fueling options, and I’ve summarized the differences in the table below. The upshot? I use level 1 rarely, level 2 routinely, and DC fast charge for long trips. As a scientist and general dork, I can’t resist going deeper into the technical details, but if that’s not your cup of tea, go ahead and skip on down to the next section. 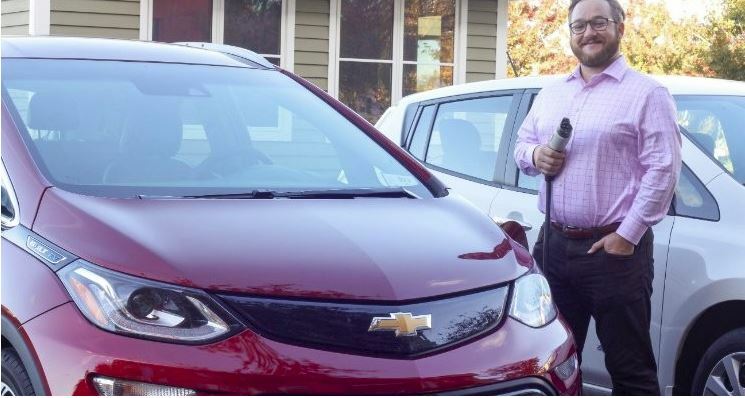 The Bolt, like most EVs, comes with a charger that can connect to any standard wall outlet (120 volts) at 8 or 12 Amps. That’s basically what Level 1 charging is: plugging your car in like you’d plug in any other household appliance. Level 2 charging uses the voltage (240 volts) and current (generally 30-50 amps) associated with higher-power appliances in the home, such as your clothes dryer. The most important thing to keep in mind here is that level 2 charging isn’t twice as fast as level 1…it’s around four times as fast. That’s because power (the measure of the rate at which energy is transferred) is proportional to the square of the voltage for a given resistance. So when you double the voltage, you quadruple the power. Another way to think about this is that power equals voltage times current. Since level 2 circuits have higher voltage and higher current, they result in much higher power. Level 2 can fully recharge the Bolt’s 60 kWh battery during a work day or overnight. Level 1 is better suited to a hybrid car like the Chevy Volt, which has a <20 kWh battery and backup gasoline engine, or for people who plug in every day and don’t drive a long way any given day. DC fast charging is a term that includes chargers with a wide range of power ratings but is faster (of course) than level 2. DC stands for direct current – the supply comes directly as direct current to charge the battery (rather than converted from AC by an on-board charger as in levels 1 and 2). Fast charging requires a vehicle that can handle it (and I’m very glad I got that option on the Bolt, it’s not standard) and a station that can supply it. Most of the DC fast chargers I’ve used have been able to provide the middle 50% of charge in less than an hour. (Fast charging gets slower as the battery is closer to full, so it’s hard to get a great sense of average rate.) I’ve only fast charged three times so far, twice on a trip to Lake Tahoe trip and once near Monterey (see below). The fast chargers I used provided about 30 kW, which took me from 25% charge to about 80% in an hour. Chargers that are several times faster than this—providing 250 or even 350 kW of power—are currently being tested. If successful, these chargers would provide most of a full charge in the time it takes to drink a cup of coffee. For now, EV owners face a number of charging challenges, or at least annoyances. Chargers are readily available along many California highways, but venture further and fast charging becomes hard to come by. (Unless you own a Tesla and so have access to Tesla’s exclusive network of chargers.) Even if chargers exist, they may not be available or functional. 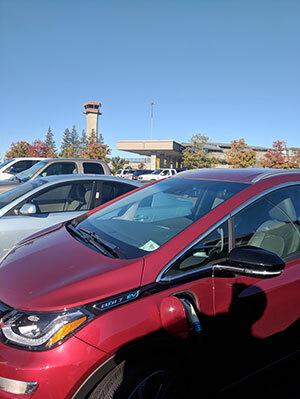 There is often a wait to use chargers in EV-dense areas, and I’ve already run into a broken charger (it had a boot screen on the display) that caused a fair amount of annoyance. Fast charging stations in California. From the Alternative Fuels Data Center. Access rules, charger standard, cost, and usage vary and are not all available in any single tool. In my opinion, the greatest need is for more reliable information on chargers. There are several apps and other online tools that help EV owners find chargers, but no one resource provides comprehensive information on charger type, cost, availability, functionality, and access limitations. To get more people to drive electric, we need to make sure that EV owners can be confident that they’ll be able to find a usable charger when they need it. Having more chargers would certainly help address the charging problem. But in the meantime, what would really help is the ability to be able to reserve a charger for the time I plan to arrive. Once chargers become as ubiquitous as gas stations, EV owners won’t have to worry about fueling any more than owners of conventional vehicles do now. But until then, being able to know for sure that you’ve got a charger waiting for you along the way would make EVs much more attractive. The great advantage of car ownership is getting to go where you want whenever you want. I’ve taken full advantage of that since I bought my Bolt. Any trip that’s 200 miles or less round-trip is well within the Bolt’s range and isn’t a problem at all. For someone living in Davis like me, this means I can easily access a bunch of popular destinations—including Sonoma, Point Reyes National Seashore, San Francisco, and Palo Alto—as long as I charge up the day before. I’ll charge my destination if it’s easy, but it’s not necessary in order for me to make it back home. Longer trips, though, require a bit of planning. A map of some of my more fun trips, with a 100 mile marker for scale. I haven’t really pushed the limits yet. West to east, destinations are: Point Reyes, Sonoma, Palo Alto, Monterey, and South Lake Tahoe. Probably the most ambitious trip I’ve taken in the Bolt was to South Lake Tahoe, about 115 miles from Davis. Climbing the steep mountains is a big part of why getting to Tahoe is tougher than a normal 230 mile round trip. Basic physics tells us that moving something uphill takes more work than moving that same object over flat ground. Driving the Bolt up into the mountains and seeing the expected range displayed on the dashboard drop much faster than usual really drives this point home. For fun, we can calculate just how much elevation affects range in theory. A Bolt carrying 4 people and luggage will likely be at least 4,000 pounds. Lifting that mass from sea level to Echo Summit (the pass you go through on the way to South Lake) at 7,377 feet requires at least 11 kWh of energy. That’s a full 18% of the total capacity of the Bolt’s battery! The good news is that you basically get to recover your entire energy investment on the return. When I made the trip, the Bolt’s battery charge basically stayed constant throughout the 50 miles from Echo Summit down to Placerville. The charge regenerated on the steeper downhills and only used a bit of energy on the flatter sections. With the cruising you get to do on the way down from the mountains, the Davis to and from South Lake Tahoe trip might be possible to do without charging, but it would take a lot of caution as well as some practice to make sure you drive as efficiently as possible. You also wouldn’t have any charge to spare to drive around at the lake. On my trip we charged twice at fast chargers. Personally, I wouldn’t make the trip without the assurance of either level 2 charging at my South Lake destination or good fast charging options on the way. I still haven’t tried out a full road trip (i.e., driving to a destination that I can’t reach on a single charge), but I may give it a shot for a few possible outdoorsy things I have coming up. To make such a trip, I’ll need to rely on fast charging during the day and find places to stay with good level 2 charging overnight. One random factor I didn’t know before owning the Bolt is that tire rotation is especially important for EVs. In a conventional car, the brakes apply equally to all four tires. In an EV, though, braking is used as a way to recover energy. This is accomplished by the front wheels (the drive wheels) only. As a result, an EV will wear the front tires especially quickly from braking. You can see that the Cruze – like any conventional vehicle – requires a lot of routine maintenance, including replacing oil, engine air filters, spark plugs, and various fluids, as well as inspecting of the thousands of moving parts that make up a conventional vehicle drivetrain. Rotate the tires and replace the passenger compartment air filter every couple of years. That’s basically it for 150,000 miles. Of course, the thing that everyone wonders about is how long the battery will last. There is no way to be sure—this is new technology, after all. The Bolt’s warranty covers 8 years or 100,000 miles, but allows for some significant degradation. The good news, though, is that batteries in electric vehicles in general have tended to hold up very well. Remember all the concerns that Prius batteries (a different chemistry, but the longest-running example we have) would need to be replaced every other year? That never happened, and in fact Consumer Reports found that “Prius’ maintenance and repair costs placed it among the least expensive 10-year-old vehicles to own. Tesla batteries have also held up very well. And by all accounts, the Bolt battery pack is very well engineered, containing an active thermal management system that keeps the battery in a good temperature range (extreme heat and cold are very bad for batteries) even when the vehicle is off. But I promise that I’ll check back in on battery resilience in my “50,000 miles of Bolt ownership” post in four years or so. Since I bought it, the Bolt has caught on. Some awards, positive press coverage, and word-of-mouth have all contributed to the Bolt becoming one of the country’s most popular EVs. Chevy and a series of other automakers have announced rapid expansion of their fleet of EVs; finally the carmakers are competing to win in the electric marketplace. Although EVs are still a small share of the market even in an EV-friendly state like California, the future of the electric vehicle looks very bright. We still need technology improvements to increase range, charging speed, and performance, but the vehicles we can build today are already fantastic. We also need a greater diversity of EV models: bigger vehicles for families, four-wheel-drive EVs for snow lovers and campers, etc. Finally, we need more charging infrastructure and much more reliable information about the chargers that already exist, but these are in the works and should be achievable. It’s been really fun to be a part of the EV movement so far, and I can’t wait to see where it goes. And of course, one of the very best parts of being an EV owner is that you never have to buy gas. My new favorite terrible dad joke is when anyone mentions going to a gas station and I get to ask, “What’s a gas station?” Eventually, that will be what all the kids say.